We're on a mission to give every student the opportunity to learn computer science. Help us continue to make an impact! Follow us on Facebook or on Twitter and re-share your favorite stats. Click each photo to retweet. And, many of these test-takers were female or minority students. 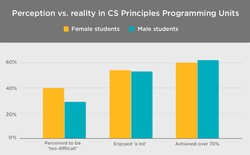 Young women are 11% more likely to say the CS Principles programming units are too difficult for them, but they score just as high as male students! There’s something wrong here: Schools reaching the most diverse student groups are far less likely to offer computer science. Students at these schools never even have the chance to learn. Early results from teachers who shared their Professional Development experience suggest anyone can teach CS, and their students perform just as well! Teachers from any background can teach computer science. Over the last 5 years, Code.org use in schools has expanded across the US. Here's a look at the growth in US schools from 2013-2018. Nearly one-third of all U.S. students are learning the curriculum of the future. Millions of students are learning computer science - here's a look at where Code.org is used the most (outside the US). According to Code.org's "fun-o-meter," turns out our students get a case of the Monday's too! When teachers from underrepresented minority groups lead AP CSP classes, their classrooms become more diverse. And over 800,000 of those students are female. And this double enrollment means more girls and underrepresented minorities are taking AP Computer Science than ever before! We're determined to change this way before then. Universities aren't preparing nearly enough computer science teachers to fill the growing demand. It's never too late to start teaching CS! Two-thirds of computing jobs are outside the tech sector, which is why we need teachers from diverse backgrounds. Teachers at our past workshops came with varied experience from all over the country! We have scholarships for teacher professional learning available to help us reach high needs schools so we can change this picture. Don't be intimidated; almost half the teachers in our Professional Learning program have zero prior experience teaching computer science. Teachers shouldn’t have to teach computer science alone—professional learning is critical to creating teacher communities and support networks. Apply for a workshop in your area here. Schools with diverse student bodies are less likely to offer computer science courses, but when they do, the students sign up! Black, Latino and other underrepresented minorities want to take computer science. Let’s give them that opportunity. Title 1 schools—which receive extra funding based on the number of students from low-income backgrounds—are less likely to teach computer science than schools not receiving additional funding. Help us change that by applying to teach computer science in your school. Code.org partners with researchers on a variety of studies. Want more? View Code.org's in-depth research and data. Over 800,000 teachers have taken steps to bring computer science to their schools. Does your local school teach computer science? Encourage them to start today! With over 200 partners, since 2013, the Hour of Code has reached 10% of students around the world. Tracking the work of thousands of teachers and millions of students.